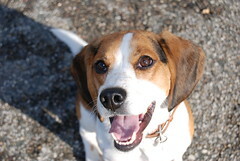 this is clyde, a recent big on beagles alumnus. shortly after his foster family adopted him, he ran into health issues and his forever home family ended up having to shell out over $10,000 to save his life! so right now big on beagles is helping them out by collecting donations (tax receipts will be issued) through the charity site canada helps. if you are so inclined, please click here to make an online donation. It's enough to melt your heart. And that's just what Clyde did after being rushed to the Veterinary Emergency Clinic last month. He melted everyone's heart - from the surgeons to the custodians. He melted them all. Being the cutest beagle in the world (with the exception of yours, of course) certainly helped, but it was something else that captured their hearts. Never once did Clyde give up, nor did her complain. He's our Braveheart. You might remember Clyde from last summer. He and his sidekick, Bonnie, were found wandering the wooded areas of Timmins. Just two little pint-sized beagles far from the comforts of home. But Clyde was actually traced back to a breeder who had no interest in his safe return. Perhaps Clyde had outlived his purpose, considered of little value given his estimated age of 8. But you can be sure he was of value to us. When Bonnie got adopted, Clyde grew depressed. That's when the shelter staff called us and the rest, as they say, is history...but not quite. I don't think we ever told you about Clyde's foster family. Without them, there would be no history-in-the-making. Not for Clyde and certainly not for Rosie - a very sickly little beagle we rescued 2 years ago that we never could have imagined would be living the dream with this incredibly generous family today. Jen and Aron are the kind of people you thank your lucky stars for every day. The kind of people who put their heart and soul into bringing the wag back to a dog's tail. They're also the kind of people who fall too hard to ever say goodbye. Foster dog, Rosie, became perma princess despite all her health issues. And not too long ago, we celebrated Clyde joining their family forever. Clyde almost died last month. If it were not for his foster parents turned forever parents, he wouldn't be here today. They spared no expense to save his life. It happened so suddenly. 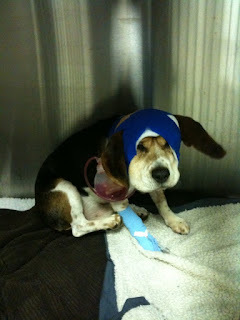 Clyde needed a large mass removed from his neck which ultimately meant losing two lymph nodes and his salivary gland. He was in hospital for 5 days. As to the cause, it remains a mystery. His specialists were baffled, but there is a very real possibility that little Clyde was carrying this ticking time bomb for a while, perhaps from the days before his rescue. When you're hungry enough, you'll eat just about anything. Something he ingested may have caused a growing infection that only now has come to light. His guardian angels...I'll have to visit that site.